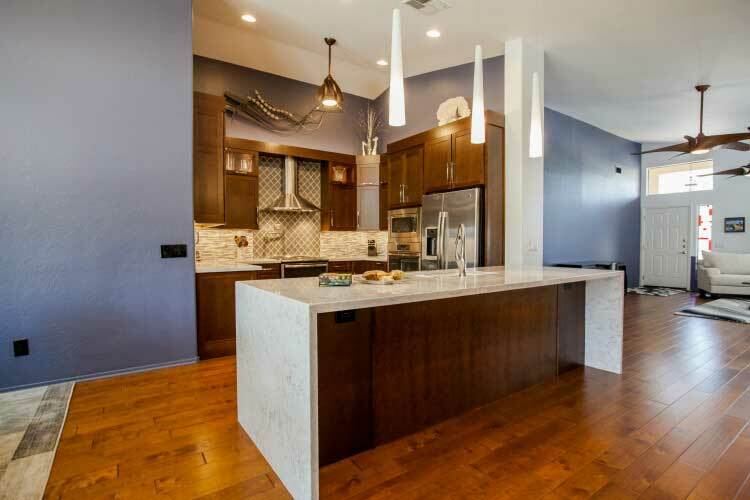 Tri-Lite Builders can be your kitchen remodeling contractor in Paradise Valley. 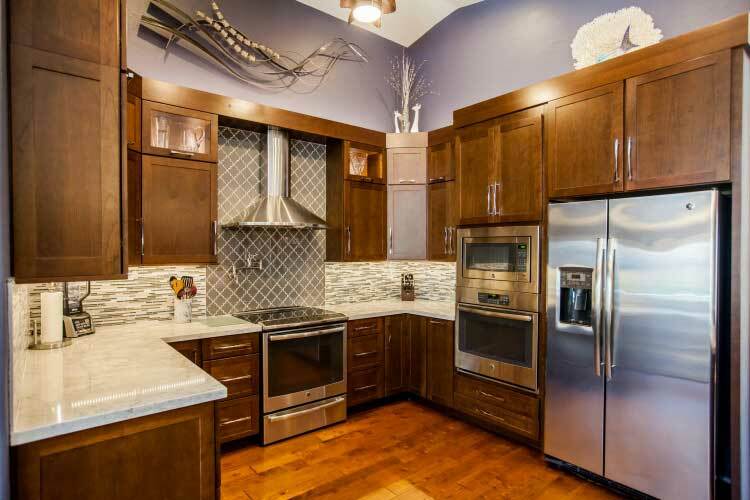 Wouldn’t preparing meals for your family be more enjoyable in a kitchen like this one? We can make this a reality for you, too. This spectacular remodel sprang from the homeowners’ desire to be able to comfortably seat five adults at a spacious island. 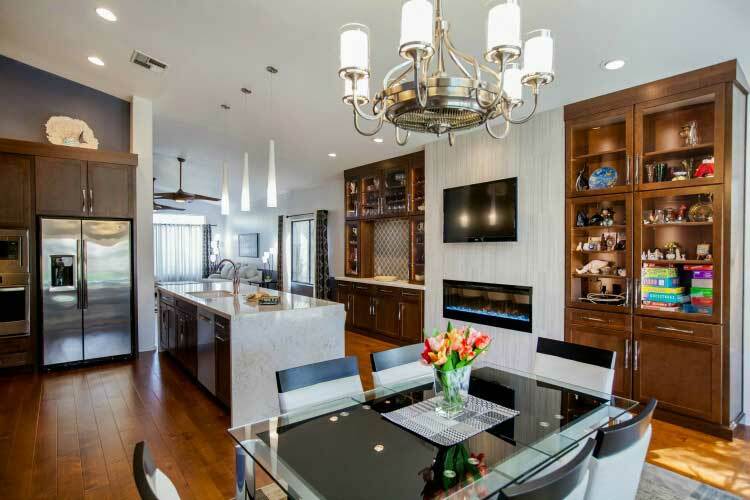 Now her redesigned modern kitchen makes all of her wishes come true. 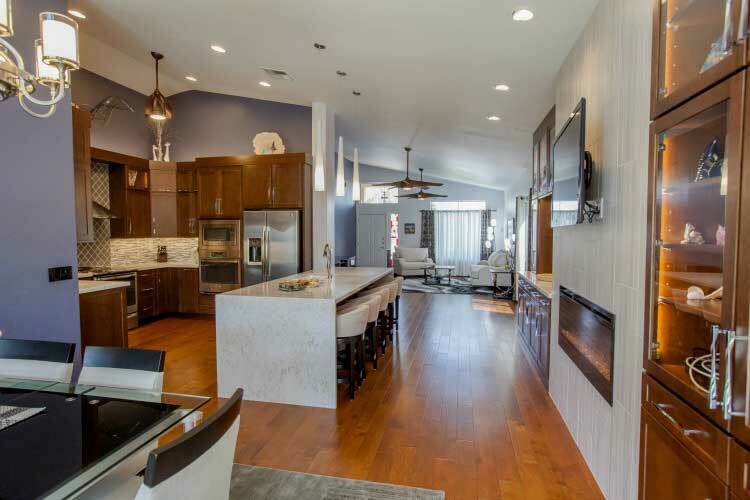 The innovative designer in charge of this project from Tri-Lite Builders reconfigured the layout of the kitchen and dining area in order to accommodate the over-sized island. It features a mitered waterfall Silestone “Pulsar” counter top, Delta single lever faucet and a Rohl “Allia” 2-bowl undermount kitchen sink. Modern stainless steel appliances and an electric powered fireplace mounted on the wall that glows in a variety of colors were also added. 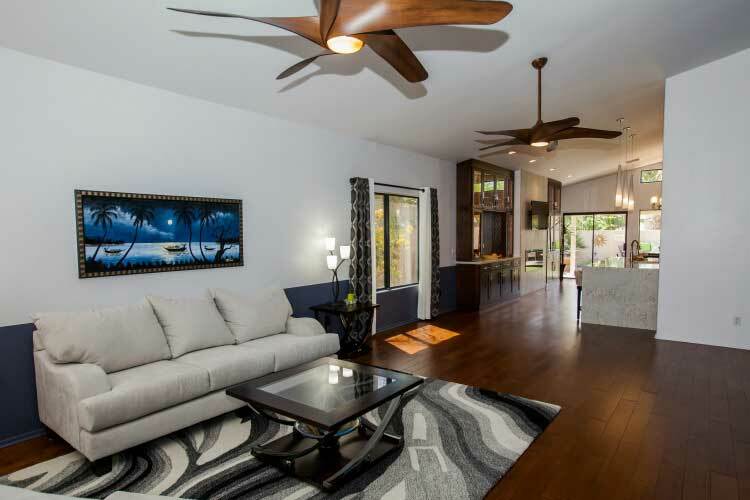 New windows that show off the beautiful back yard entertaining area make this space open and inviting. 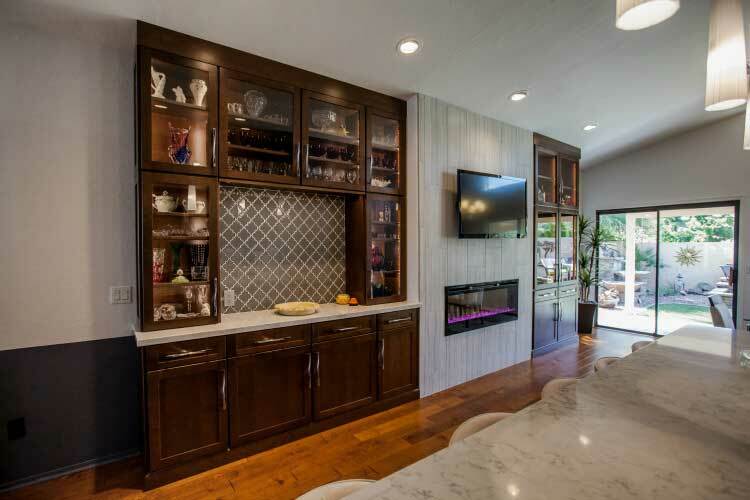 Also, a generous number of Cherry cabinets with a Fireside stain and sleek, contrasting stainless steel pulls add to the drama! Tri-Lite Builders can make your kitchen a place to be proud of and enjoy again. Gorgeous new flooring, in the form of a beautiful Southwest Birch wood plank, complement the color palette and add richness to the space. 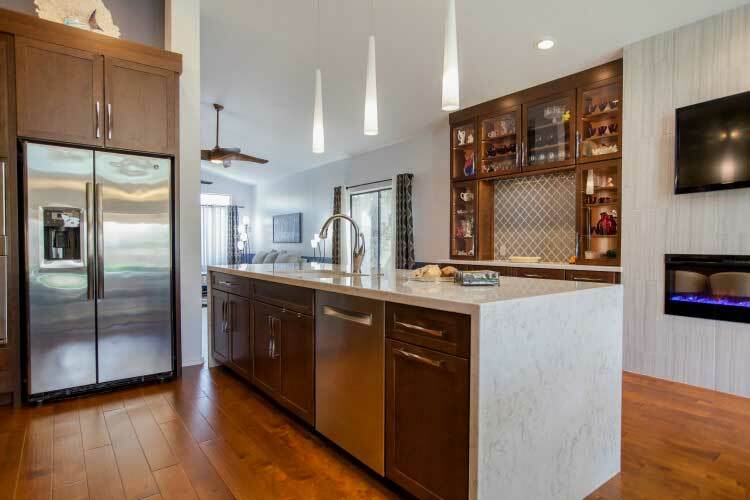 A layered lighting plan was designed so that there is always sufficient lighting, whether it is general ( can lights), ambient (island pendants), or task (under cabinet light strips). Decorative tiles, a gray glass in an arabesque shape and a Carrera glass mosaic, enhance the entire kitchen back splash and the adjacent built-in unit. Now, as our homeowner is preparing an evening meal, the family can gather around and join in the fun! 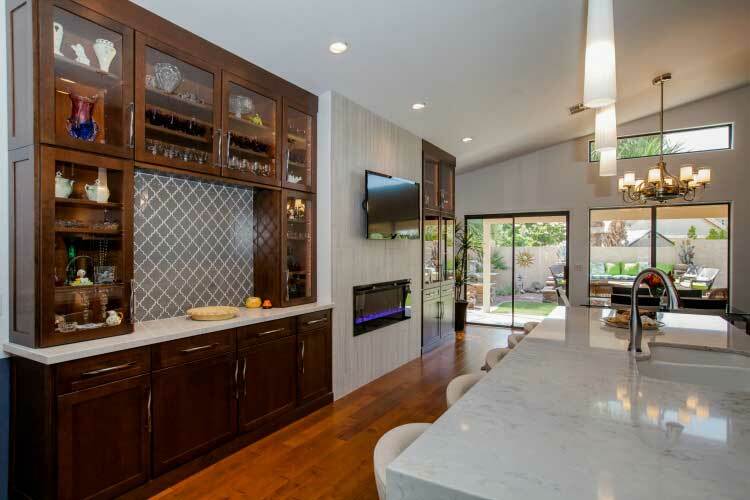 As the premiere kitchen remodeling contractor in Paradise Valley, Tri-Lite Builders can make your kitchen a place to be proud of and enjoy again. Contact us for a free, in-home consultation to go over your remodeling project. 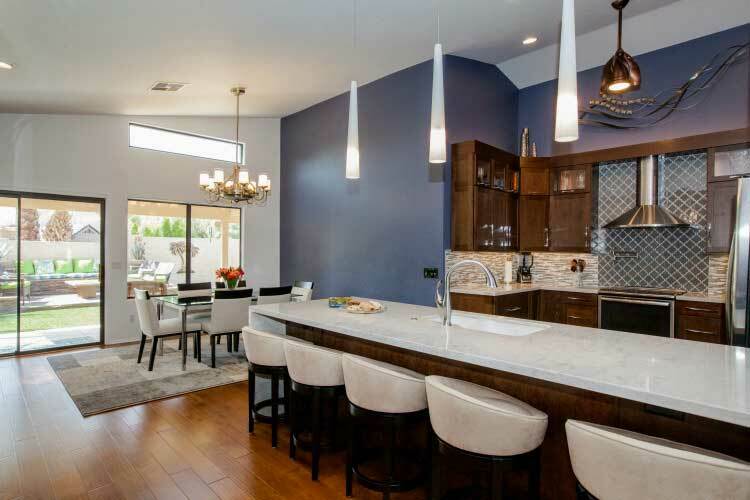 Tri-Lite Builders serves happy homeowners in Phoenix, Arizona, and its surrounding communities with all aspects of home improvement including kitchen and bathroom remodeling.